I finally got all the parts machined, yea! Or at least roughed out enough for testing. The combo axle/brass cap/screw were a royal pain due to lack of advance planing. I don’t think I’ll use this in the future. The idea is, as the lever cap is tightened, it will exert a force that will try to push the sole away from the body and the mouth is a hinge, so use the screws to tie the cap to the sole. In practice, it doesn’t seem to be an issue but I wanted to be sure for sure. Unfortunately, space for the screw is really tight (less then ¼”) so I used a #6 screw with a really cut down head (from > ¼ to 3/16). I had to drill the assembled plane so make sure the hole through the sole, wood, cap and axle were all in line. And the wood had to be at the final width so the caps would stay flush. Uggh. I also tapped in situ, which caused a major mess on the second as it packed up with sawdust and busted the tap. That took a lot of patience I don’t normally have to get enough of the tap out to disassemble enough separate some parts, repeat, repeat down to the axle. Since I only had the one tap, I reground it and was able to finish the threads. I’m still amazed I’m not in the process of making new parts. The brass caps are just to add visual appeal and spread the load a bit. 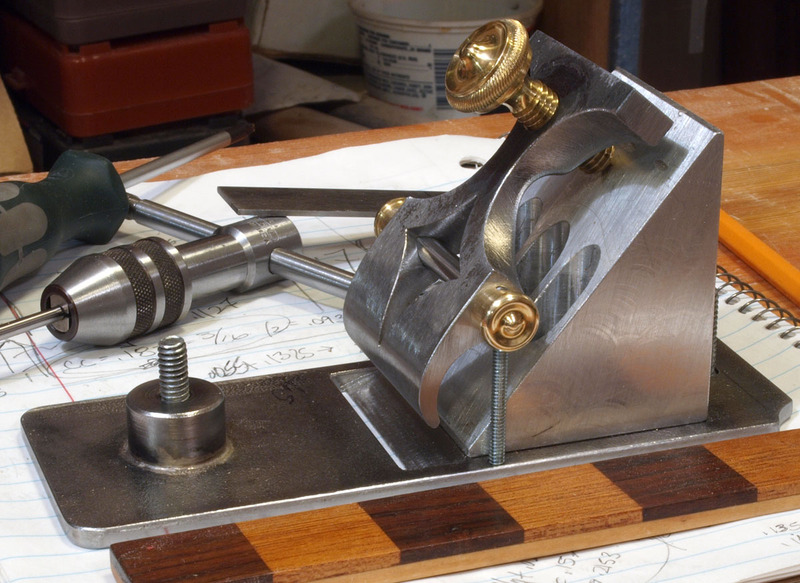 Then I could machine the sole; it was pretty good, I took about 0.004″ off. I then planed everything in sight: maple, apple, oak, ebony, purpleheart; it works good. 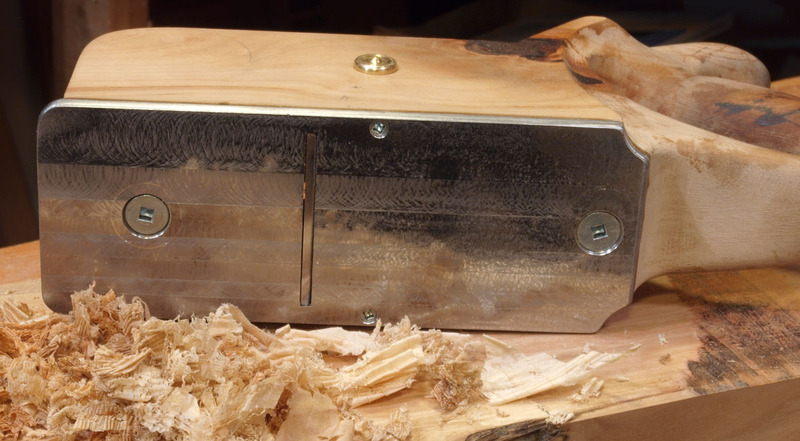 These shavings are about 2 ½ thou (0.0025″). Now back to shaping (left brain to right; cool optical illusion).